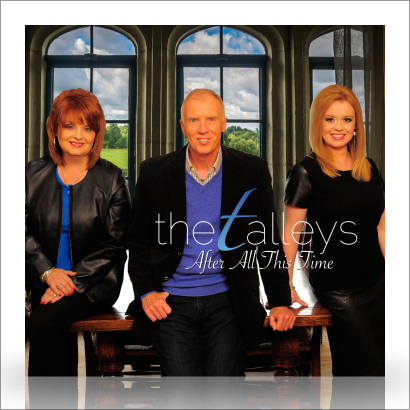 Morristown, Tennessee (April 18, 2016) Award winning Gospel artists, The Talleys, are excited to announce the release of a brand-new short concept film featuring their latest single, “People In The Line” The song is the first release from their highly acclaimed recording, After All This Time which won the Progressive Album of the Year at the Absolutely Gospel Music Awards on Tuesday night, April 12th in Nashville, TN. Starring Jedda Meyers and Lauren Talley, the short film depicts a woman (Talley) going about everyday routines when a stranger’s (Meyers) suddenly tragic circumstances cause her to be aware of the struggles of others. 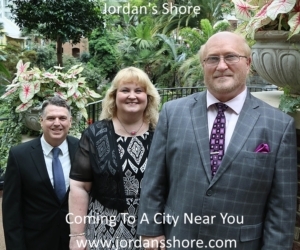 The film was shot on location at Forrest General Hospital in Hattiesburg, MS, the Kelley Marie Boutique and Manley Baptist Church in Morristown, TN, and was produced and directed by Jared Meyers of Meyers Media / The Talleys. The Talleys premiered the People In The Line short film at the Absolutely Gospel Awards April 12, 2016, and the film was released online and to various media outlets April 13, 2016. The song and film are both now available at www.talleytrio.com. 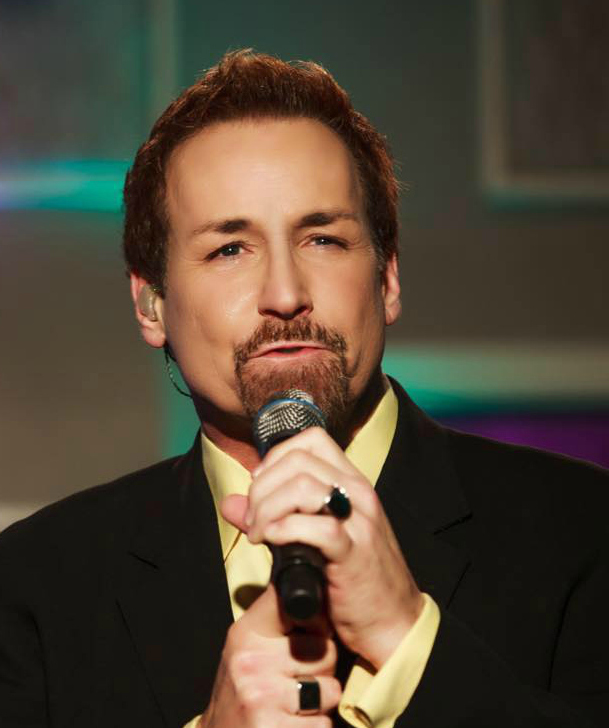 Nashville, Tennessee (April 15, 2016) Multiple award winning Gospel Music superstar, Michael English has added two more awards to his accomplishments. On Tuesday April 12th, Michael was presented the prestigious Fan Favorite and Male Vocalist Ovation Awards. The evening featured show-stopping performances from Michael English and Amber Nelon Thompson singing Amber’s hit “Another Time, Another Place” followed later in the program with a soulful rendition of “A Little More Jesus” with special guests The Nelons. The fans in attendance also got a preview of the upcoming Sing Tour featuring Michael, the Nelons, and Jeff Stice. 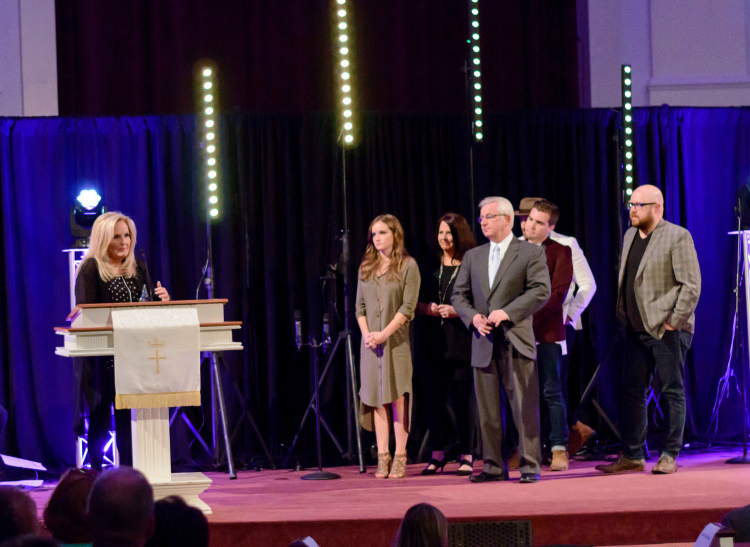 Dahlonega, GA (April 14, 2016) Multi-award winning Gospel group, Karen Peck and New River added three more awards to her collection at the prestigious Absolutely Gospel Music Awards in Nashville, TN at the Nashville First Church of the Nazarene in the heart of downtown Nashville. Coming off winning numerous big awards, including a Dove Award last year, this outstanding group is at it again. Starting this year by winning the “Song of the Year” for “Pray Now”, “Album of the Year” for Pray Now, and “Mixed Group of the Year”, this appears to be another phenomenal year for this very popular group. Not only is the group being recognized for their performance abilities, but for the second year in a row, Karen has been a co-writer for the “Song of the Year” with Dave Clark and Michael Farren. Karen enthusiastically tells all in attendance of her concerts that “God will answer your prayer just as He did for her husband Ricky, healing him of cancer”. Karen Peck and New River is currently racing up the charts with their newest radio release “I Am Blessed”, so just sit back and watch this great song not only move the hearts of men and women, but move swiftly all the way to the top of the charts. 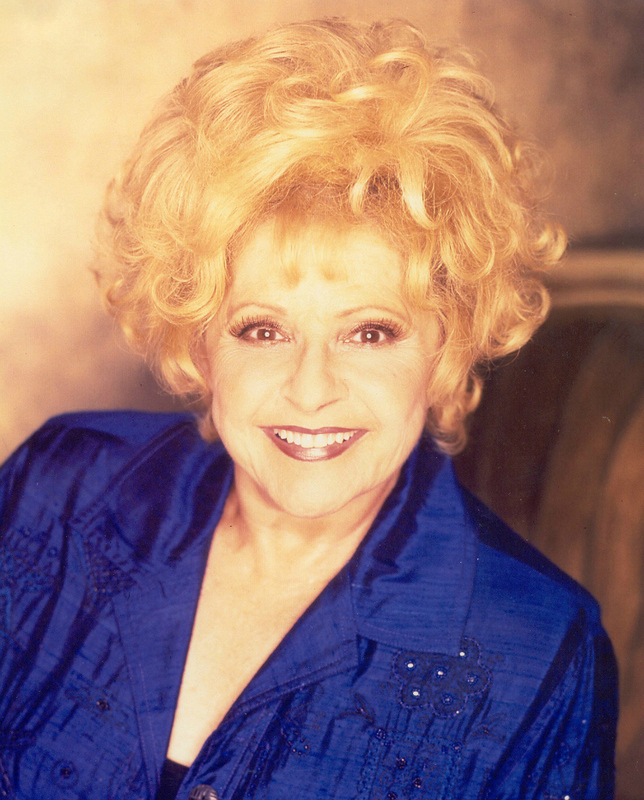 Nashville, Tennessee (April 5, 2016) The Music City Christian Fellowship (MCCF) announced today that Rock-N-Roll, Country Music and Rockabilly Hall of Fame Legend, Ms. Brenda Lee, will be returning to Host the 36th Annual Sunday Mornin’ Country® Celebration at the Grand Ole Opry House, Sunday, June 12, 2016, at 2:30 P.M.
Ms. Lee, also a Grammy Lifetime Achievement Award recipient, has partnered with this event on numerous occasions over the years. Her unique blend of humor and engaging connection with the audience is a perfect complement to this uplifting concert. Previous line-ups have included over two hundred Top Name Country Music Artists such as Ricky Skaggs, Connie Smith, Roy Clark, Linda Davis, Chris Young, The Whites, Bill Anderson, George Hamilton IV, Lynn Anderson, Ray Stevens, The Oak Ridge Boys, Jimmy Wayne and many more, along with Gospel friends / legends like Jason Crabb, Vestal Goodman, Michael English, Guy Penrod and The Fox Brothers. Early shows included stars Roy Acuff, Tammy Wynette, Grandpa Jones, Skeeter Davis, Bill Monroe and other legends that have since gone home. Sunday Mornin’ Country® is great entertainment the whole family will enjoy as Country Music Artists come together to share their hearts as well as their favorite Gospel songs. The Music City Christian Fellowship presents this concert at the conclusion of CMA Music Fest/Fan Fair each year, leaving the Fans & Guests with an uplifting memory of Nashville that will last a lifetime! Tickets for Sunday Mornin’ Country® are ON SALE through the Opry Box Office (1-800-733-6779) or (www.opry.com – click on tickets) and Ticketmaster (www.ticketmaster.com/event). Visit www.MusicCityChristianFellowship.org for more information. The Music City Christian Fellowship is a 501©3 non-profit organization and all artists volunteer their performances at the June 12 concert. Positions on the MCCF Board of Directors are non-salaried. Sunday Mornin’ Country® is a registered trademark of the Music City Christian Fellowship. Watch for artists to be added to the 2016 line-up as they become available. Artists scheduled to appear subject to change. 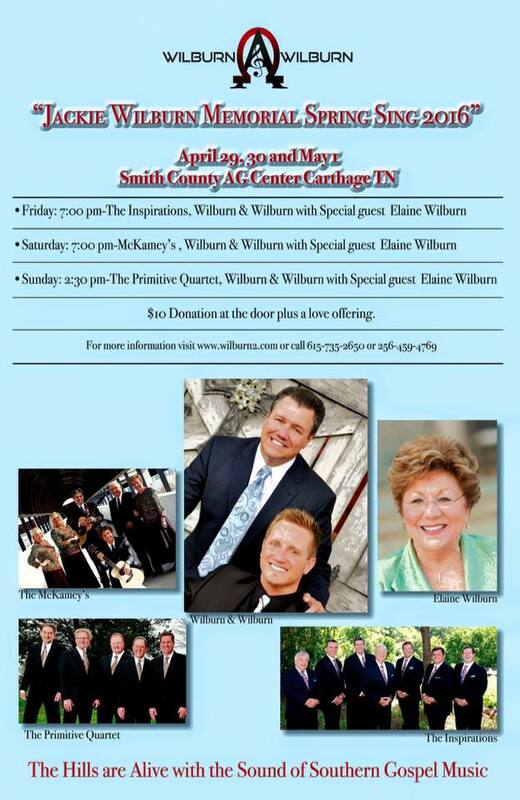 Carthage, Tennessee (March 30, 2016) Award winning Gospel duet Wilburn and Wilburn are excited to announce that this great annual event is expanding to three days. The talent line up at the 2016 “Jackie Wilburn Memorial Spring Sing”. Joining Wilburn and Wilburn as well as Elaine Wilburn all three days will be The Inspirations, the McKameys and the Primitive Quartet. 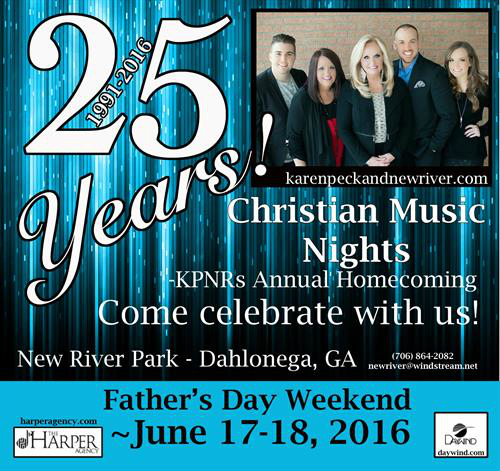 For more information about the Homecoming you can E-mail Karen Peck and New River’s office at newriver@windstream.net or go to the website at http://www.karenpeckandnewriver.com/christian-music-nights-2016/ .